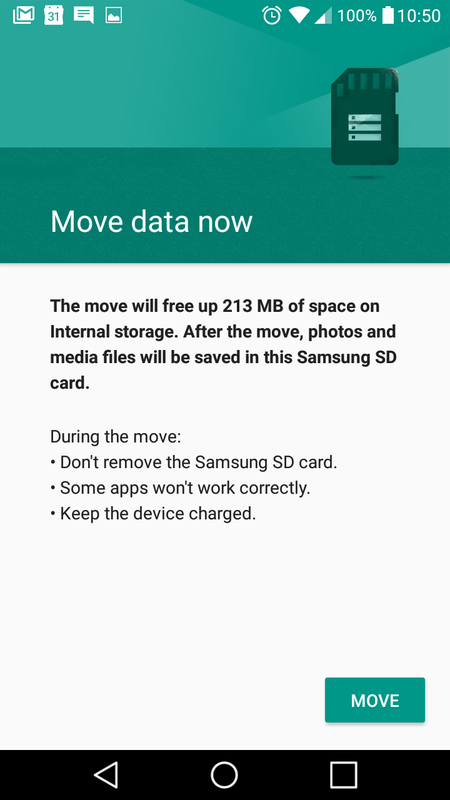 One of the coolest – if unsexy – features of Android Marshmallow is its ability to use adoptable storage. 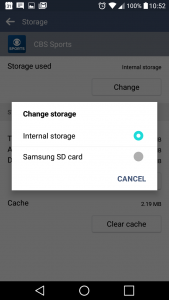 This means Android can treat an SD card as additional internal storage, rather than an external device, as it has in the past. Under the hood, Android will still see two separate devices, but it will (more or less) treat it as a single storage unit. It’s almost (but not quite like) having a 2TB drive in your desktop computer, then buying a 2TB external drive and, after installing it, Windows giving you the option of treating the drives as a single 4TB unit instead of two 2TB drives. It’s kind of like that, only better, because it’s much more difficult to expand a phone or tablet’s internal storage than to do the same on a desktop computer. Unfortunately, two of the biggest Android device makers – Samsung and LG – have disabled this feature in their versions of Marshmallow. They claim that customers would be “disappointed” in the performance of their devices, since an SD card is likely to be slower than the internal memory. This is true, but not a dealbreaker if you know that going in. They also claim that SD card failure would cause apps to break… which is also true, but it’s not the end of the world: just buy a new SD card, repeat the procedure below, and reinstall the apps in question. As someone who played around with CyanogenMod a LOT a few years back, this is not a problem at all… especially since SD cards don’t fail that often. So this post will show you how to enable the feature. There are a few caveats, however. The first thing – and this should go without saying – is to make sure to back up any important files you may have on your SD card before you do this. This procedure WILL ERASE the card, so data will be lost forever. Also, read the instructions below, in full, and make sure you understand them completely before you even touch your phone or computer. The time to be confused is before you start an IT project, not during the project. Secondly, I have only tested this – once – on a Virgin Mobile LG G Stylo. It worked for me, but it might not work on your device. It might not even work on the same phone on a different carrier. Google “[your device] adoptive storage” and see what comes up. As always, there’s the possibility of wrecking your phone, so please research this before jumping in feet-first! Thirdly, this procedure will create an encrypted ext4 partition that will fill your entire SD card. You’ll still be able to attach your device to a computer via USB and copy files that way… but you won’t be able to take the SD card out of your phone, pop it into an SD card adapter, then put it into a laptop or desktop card reader to copy files. If you haven’t already, it’s probably a good idea to look into cloud services that offer online backups of your pictures, like Dropbox, OneDrive or Mega. Lastly, this isn’t something you can “just try out” with a spare 8GB SD card and upgrade to a 32GB card later. If this is something that interests you, go ahead and spend the $10 on a new 32GB card and be done with it. NOTE: PLEASE READ THE ‘IMPORTANT UPDATE’ SECTION AT THE END OF THIS POST FOR ANOTHER POSSIBLE ISSUE TO CONSIDER! 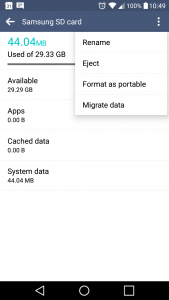 That said, here’s how to enable adoptable storage on your Marshmallow device. It’s really simple: I was able to do the entire thing in around 10 minutes… while on hold with Virgin for an unrelated billing issue. 1) On your computer, go to this page on the XDA forum and download the “15 Seconds ADB installer”. I used the current version – 1.4.3 – but it might be updated by the time you read this. 2) Once downloaded, right-click on adb-setup-1.4.3.exe and choose “Run as Administrator”. As the linked page says, press Y to “install ADB and Fastboot”, Y or N to install for all users (Y) or just the current user (N), and Y to install the necessary drivers. After the last question, you should see the standard driver install dialog. Click “Yes” (or “Allow” or “OK”, I forget which) to install the Google device driver. 3) If you haven’t already, enable “Developer Mode” on your device by going to Settings > About Phone > Software Info and tapping “Build Number” seven times. You will know you’re getting close when the phone says something like “only 3 more taps to Developer”. 4) Tap Settings > Developer Options and enable USB Debugging. Click “OK” to the warning message that will appear. 5) Connect your phone to your computer via USB. A window should pop-up on your phone asking to enable USB debugging and showing your computer’s “RSA key”. Tap “Always allow from this computer” (if desired) then tap “OK”. If you don’t see this window, drag down your notification area and look for a similar debugging message and tap that. 6) On your computer, open a command-prompt in the ADB directory (which should be c:\adb). 7) Type adb devices and press ENTER. You may see your device listed, probably with a long name, like “LGLS7709e27dc19 device”. If so, skip to the next step. If you get a message about a “service not running”, the software should say that it’s starting it, but the app won’t poll your devices again. So type adb devices and press ENTER again. You should now see your device listed. NOTE: the fourth command partitions your SD card, and may take 2-3 minutes (or longer) to complete, depending on the size of your card. 9) Disconnect your phone from the USB cable and reboot it. The reboot is crucial. Your phone may (or may not) take a bit longer to boot this time. One message board user reported that his phone appeared stuck on the Virgin boot logo for several minutes, but finally booted and has been fine ever since. My phone seemed to boot normally, maybe taking just a few extra seconds at most. Your mileage may vary. 10) Once your phone is fully booted, tap Settings > Developer Options and disable USB Debugging, clicking “OK” to any messages that may appear. Not all apps support being run from the SD card. Not surprisingly, most of Google’s own apps can’t be moved. Most can though, and you’ll get a simple, two-step wizard to move the data. 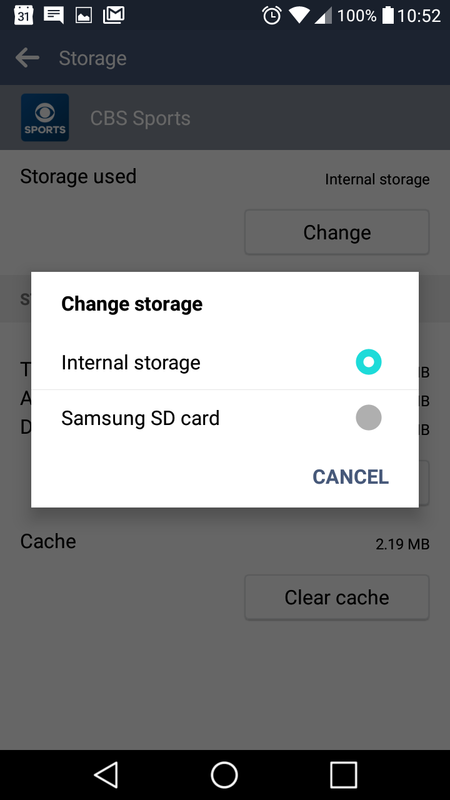 If you don’t see a “Storage used: Internal storage” option, the app cannot be moved. Also, if you use Spotify, you will need to tap Storage > Clear Data. This will reset the app, so you’ll need to log in and download all your offline music again. If you don’t do this, the app will open and immediately close (no matter what you do) until you clear data. If this sounds a bit like my old article on expanding storage on the LG Tribute… it’s almost exactly the same thing… only this time it’s using tools built-in to Android to do so. Also, root is not needed in this case, so apps that complain about root status will stay quiet. 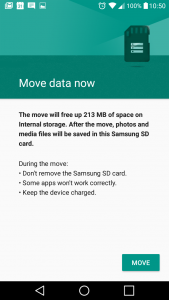 IMPORTANT UPDATE (03/12/2016): This may (or may not) be related to adding adoptive storage to my phone, but I just wanted to let you know about a possible issue that might happen, and offer a strange workaround if it does. I work from home most days, and almost always leave the lock screen on swipe, since there’s little need for security in my own home. I went out the other night, and since I was running late I quickly set the option to PIN and didn’t notice the two other options greyed out. But then I came home and tried to switch back and found that I could not. Now, my phone might have been like this for weeks, and I only just now noticed it. My carrier upgraded the phone from Lollipop to Marshmallow early January, and it’s possible that this could have happened then. That’s the point: I just don’t know. I’ve been an IT guy long enough to know that coincidences are rare… but they do happen from time to time. So… how do you fix it? I don’t know. I haven’t found anything that’s worked yet. One solution offered is to go to Settings > Security > Certificate Management and click “Clear Credentials”. But this has not worked for me. 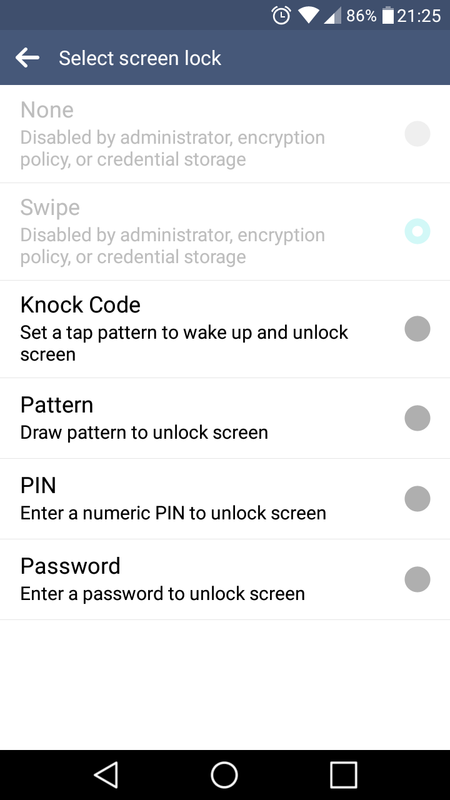 1) Go to Settings > Lock Screen and choose “Pattern”. 2) Choose a pattern, then choose a PIN if you don’t already have one. 3) Lock the phone, then enter the WRONG pattern five times. You will get a message that says something like “You have incorrectly entered your pattern 5 times. Please try again in 30 seconds”. 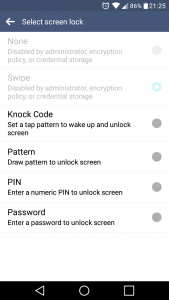 You will also see a box in the lower right corner of the lock screen that says “Backup PIN”. Tap it, and enter your PIN. 4) Until you change it, your lock screen should now be on swipe, even though it’s not an option you can select (just like my screencap above). As I said, my phone could have been like this for weeks, and I only just noticed it after adding the adoptive storage. I read several articles and how-tos online on the subject, and not one of them mentioned anything about the lock screen, so I’m inclined to think it’s just a coincidence. Huge thanks to AndroidForums member stanton renna, who actually typed all this up in a handy post. He (or she) did all the real work – I just wrote it up in my own words and added a bunch of screencaps! Thank you so much for your step by step instructions. I am not a techy, but I think I can follow these steps. Thanks again! Forgive me if this is a dumb question, but is there a way to reverse this back to portable storage? I’m only asking for curiosity’s sake. No idea. Like I said, I’ve only tried this, once, on an LG G Stylo. I can’t imagine it WOULDN’T work on a similar LG, though. Quick question: if I change the SD card from the phone after doing those steps, what commands in the CMD should I run again? All of them? Yes. You can convert an existing SD card back to Portable Storage by tappping Settings > Storage > [your SD card} > three dots > Format as Portable. You may (or may not) be prompted to move the data back to internal storage (reversing step 12 above). But yes, if you swap SD cards, you’d need to repeat the entire procedure. After “adb shell sm list-disks” command gets “java.lang.illegalargumentexception” error. How can i fix it? Tried on a Sony Z3, Seemed to work, but the camera app could not save to internal storage. So reverted back to the portable mode for now. Any thoughts on that? Thanks a lot. works with my LG G4 Stylus. Thanks, it worked with my LG K8. Although I had to use a Windows 7 PC as my Win10 laptop didn’t support the adb software. Is there a way of doing this from a Mac? I use an Apple for computer work, but prefer the LG for my phone. Jim, in regards to your important update. As far as I know, all of the payment apps require screen lock of some sort. So, if you are using Android Pay or an individual cards android payment app those choice will be greyed out per the apps security features. Thanks, but I didn’t have Android Pay or PayPal (or any other type of banking software) on the phone. For lg k350 work ? Kindly replace 179,4 with the output you receive in first step. So far, everything seems to be working for me. Hope that helps! Hi, thank’s a lot, it Worked on my LGK8 !! But Once my internal memory (8Gb) is almost full, it won’t let me install more apps and tells me to make room on me internal storage, even tho i migrated all my apps on the “new interal storage SDcard”, some files stay in the internal memory and can’t be moved. I’m at 7Gb and it won’t let my instal a big app…. Anyone else has that? Can anyone help me, my LGK8 says i used 7Gb out of 37ish but i can’t instal more apps !! First, if your phone refuses to be shown in adb devices in Windows 10 (a known issue with LG K8 and others) change USB connection type to MTP to PTP to force it to read your computer’s RSA key. It’s useful if you have Windows 10. Second, the fourth command will likely fail if you follow the tutorial. 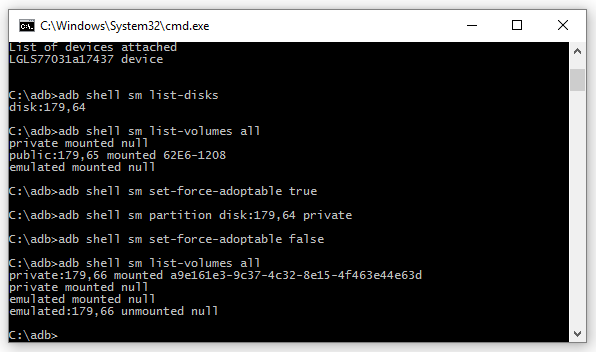 Get the value of your storage given in the first command, substract one, and then put it into the fourth command for it to work. Does it work on an LG Pheonix 2? I’m getting a java error on the 4th command… anyone else have that problem or know what I need to do to get around it? Worked for my LG X Power (Brazilian K220). Thanks so much!!! Thanks for the instruction. I got it to work on my LG g pad 3 8.0 (Canada) with Nougat 7.0. This model is similar to LG g pad X 8.0 in the USA. Ugh. So, I’ve obviously gone wrong somewhere. I got through all of the steps without issue, but after I rebooted my phone (an LG Stylo 2), the SD card displayed as corrupted and I was given the option to reformat it. Reformatted, but it’s displaying that there’s only 15.97MB on my SD card – it’s a 32GB SD card. Is it a lost cause, or can my SD be saved? Any ideas? Thanks or this! I’m not all that tech savvy with cell phones but you have done an awesome job showing screenshots and providing detailed instructions so much so that I believe you’ve helped me to be on my way to resolving my storage issues IF I become confident enough to do this, I will follow your directions to the letter. Yours are the best I’ve found online so far. I used to work with computers some, not an expert but above average knowledge, so with your help I should be able to do this. I just want to know that everything will function properly when I’m done as long as I follow your steps. 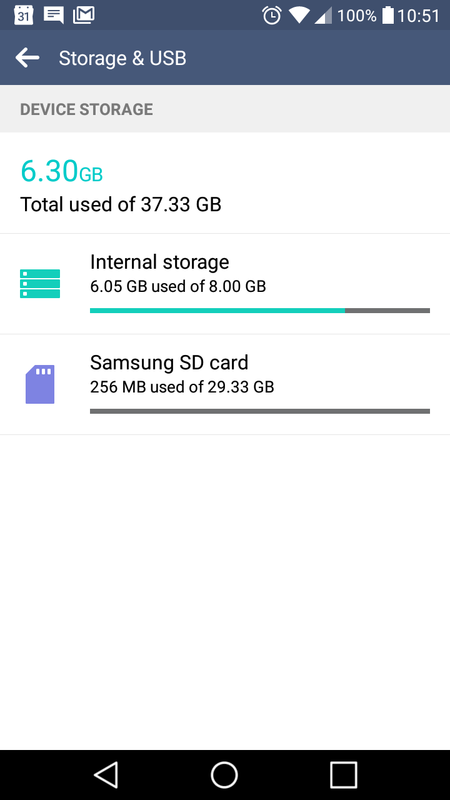 I need this adoptable storage on my LG Stylo 2 Plus so badly because 16gb is not enough for my apps and my phone began to malfunction. I have spent many hours trying to figure this out so thank you again soooooo much for making this seem like a task I can successfully complete! My adoptable storage went away and tablet(LG) now shows internal and sd card and most of my apps are greyed out… if i try one, it says “App isn’t available”. Help!! Thanks it works perfectly on G4 Beat. Only a few app (like twitter) causes issues when moved to adopted storage. Adams?n Jim reis! Worked great on an LG Stylo 3 Plus (TP450). Added a 64GB U3 speed card. I now have 90 GB to use. Thanks I got my LG class(LG-F620) to recognize the card as internal. migration is still ongoing and it seems to take bit too long but so far it seems to work. such a savior for phones with tiny internal memory! I know this is an old article. Though the reason you lost the ability to have no password or swipe is because the SD was encrypted. On every Android version that I have tested if you encrypt the SD in anyway you will be forced to use authentication. but its a simple slow phone anyway. Thanks, this has worked a treat on LG K8 & LK K3, I even have a 64gb card as adopted in my K8 when the specification says 32gb max. I actually left adoptable storage TRUE on & have had no issues. This worked for me today on my LG X Charge running Nougat 7.0. I had to install drivers from the LG Website in order to obtain adb driver. In addition to turning on USB debugging, you must also turn Oem unlocking on. THANK YOU for this awesome tutorial! That’s correct. 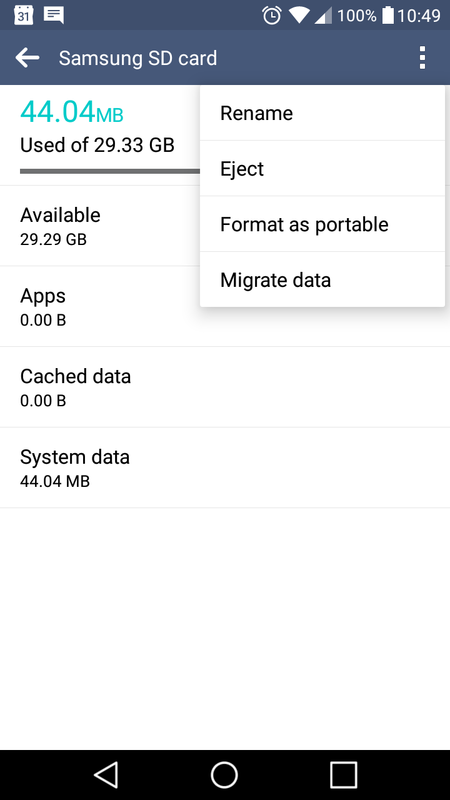 I’ve moved on from my LG phones, but my new ZTE phone won’t even show “Move to SD card” as an option unless and until you format the SD card as adaptable storage. You need to install the DEVICE DRIVERS for your phone on your PC or ADB will not see your phone. You can usually get the drivers directly from manufacturer and/or carrier. It may also help to set your android USB config to PTP or RNDIS instead of MTP for some phones… this is under developer options:networking. Will this work on a LG Aristo 2, aka LM-X210MA? I have tried this 3 times and it keeps corrupting my SD card. Hears a strange one… Huawei P9 lite, 32GB SD card. All seems to have worked fine, except that it’s saying I now have a 64GB card, and -5,27GB free. It *seems* to be working … so far …. It works on ASUS Zenfone Max Pro M1. Very good tutorial on adoptable storage for Marshmallow (6.0.1). I own a Tracfone ZTE Zmax Champ (Z917VL) running Marshmallow (6.0.1). I can’t root it. Tracfone has the bootloader locked down tight. 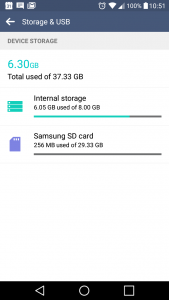 Your tutorial on adoptable storage was the only way I could get apps to install to external storage (SD Card). Hi! I followed these steps and successfully made my sd card as internal storage but when i opened my camera app today it wouldn’t take pictures and when taking a video i got the error message “warning recording failed”. Can you tell me the source of this error and if i can fix it? ?